Get your taxes done and enjoy some deals! Here are list of deals for Tax Day! Please check participating locations! Boston Market: From Wednesday, April 10 through Monday, April 15, Boston Market will offer dine-in guests the “Tax Day Meal Special.” It’s a Half Chicken Individual Meal with two sides, cornbread and a regular fountain beverage. The special will cost you $10.40. Bruegger's Bagels: Get 13 bagels and two tubs of cream cheeses for $10.40 through Monday at participating bakeries. You must be a member of the Bruegger’s Inner Circle...go to their website to sign up. Cinnabon: Two free Cinnabon Bites April 15 from 6 to 8 while supplies last. Check participating locations. Corner Bakery: April 15 to April 17, dine-in customers at the Corner Bakery will be able to enjoy a buy-one-get-one deal and claim two entrees for $10.40. 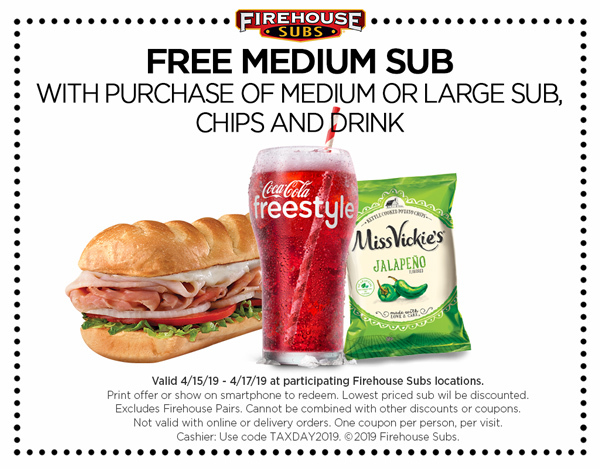 Firehouse Subs: Buy a medium or large sub, chips and a drink will get a second medium-sized sandwich for free. The offer is valid from April 15 through April 17. Customers will need to present this exclusive coupon to redeem the offer. Hot Dog on a Stick: Stop into any participating Hot Dog on a Stick shop for one free turkey or veggie dog on April 15. There’s a limit of one dog per customer, but no purchase required. Hooters: From April 12 through April 15, kids can eat free at Hooters with any $15 adult purchase. Menchie's: Get a free frozen yogurt when you download the Menchie’s app by April 15.